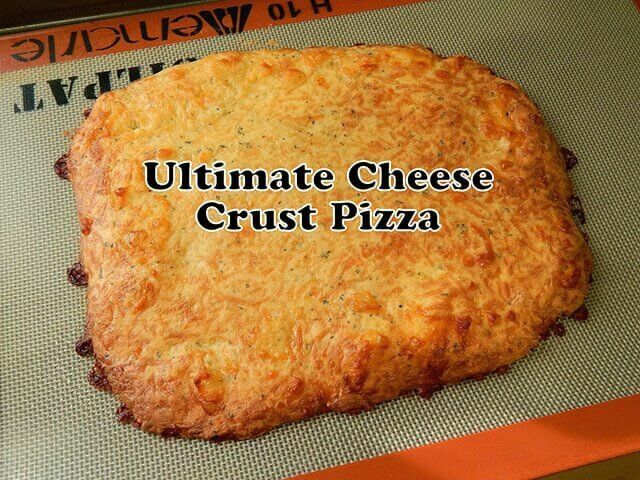 I know there are about a million low carb pizza crust recipes on the web. I even have one of my own that has received great reviews from those who have made it. I wanted to play around and see if I could make something a little more simple but just as delicious–and maybe even cut the carbs down even lower. Well, I tried– and I succeeded. I can honestly say that this is now my favorite pizza crust by far. 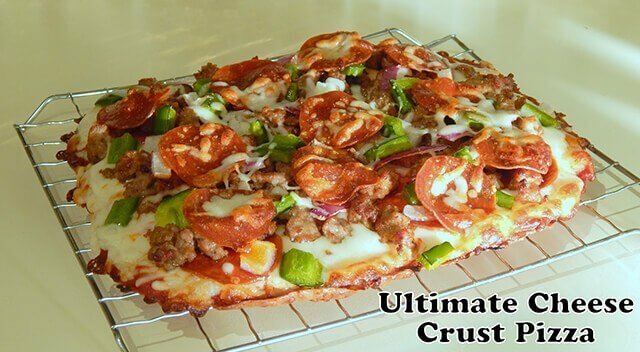 Here is a photo of the base crust– the beauty of the whole recipe. 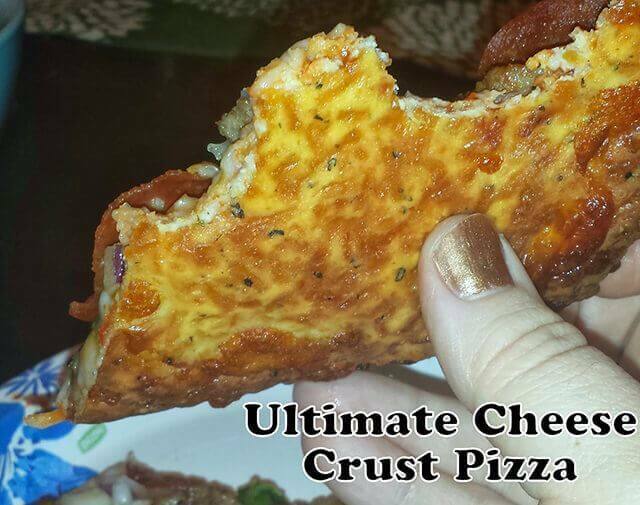 What makes this low carb pizza crust so special? Well, its limited ingredients, first and foremost. Its flavor and texture are a big part too. So what is the texture like, exactly? 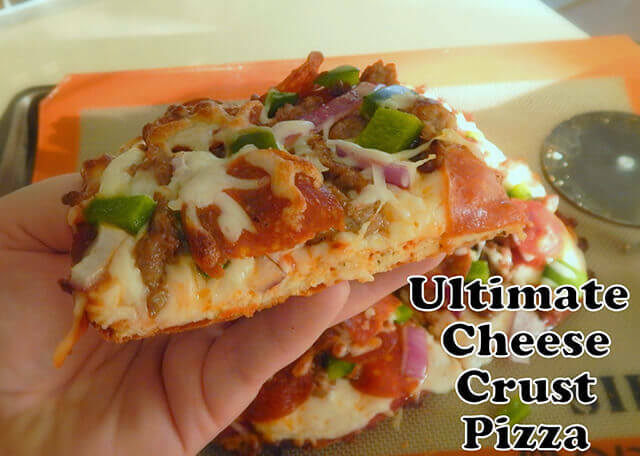 Well, it’s got a nice crunch and a chewy middle that is firm and perfect as an everyday pizza crust recipe. The addition of garlic and basil give it a real Italian kick too. The crust holds up great to even copious amounts of toppings (as you can see). When I topped it and put it back into the oven, I wanted to lift it above the pan and allow it to develop and extra crunchy bottom. I recommend using a cooling rack to do this. It was absolutely delicious! Look at the crisp, golden goodness of the bottom of the crust! I decided to free form this crust instead of putting it onto a pizza pan, but if you prefer, you could definitely do a medium sized round pan instead. Since the prepared dough is very wet, you’ll simply press it down underneath a layer of plastic wrap. After telling my husband all of the simple ingredients in this low carb pizza crust, I begged him to take a bite. He’s super picky and really weird about certain foods. His feedback was great. “Not only is it delicious,” he said, “but a year ago, if you would have told me you could make real pizza crust out of eggs and cheese, I would have told you that you were nuts.” Now that’s a winning comment! Preheat oven to 350 degrees and place a nonstick liner on a cookie sheet or pizza pan (or grease very well). In a medium bowl, combine together mozzarella cheese, parmesan cheese, garlic powder, basil, salt and eggs. Stir very well with a sturdy spoon for at least a full minute until everything is mixed well and the eggs are broken down and evenly distributed. Use a sheet of plastic wrap to press the dough down evenly into your pan (I used a freehand style right in the center of a large cookie sheet). Place into the oven on the center rack and allow to bake for about 20 minutes or until the edges are deep golden brown and the center is a light golden brown. The center should be firm and should not jiggle at all but shouldn’t be too brown. Turn the oven temperature up to 400 degrees. Allow the crust to cool slightly before attempting to move it (about 10 minutes). Remove the crust and place it onto a metal rack and set it back on the pan (this is optional, as you can set it right back on the pan– but I feel this makes the crust crispier. 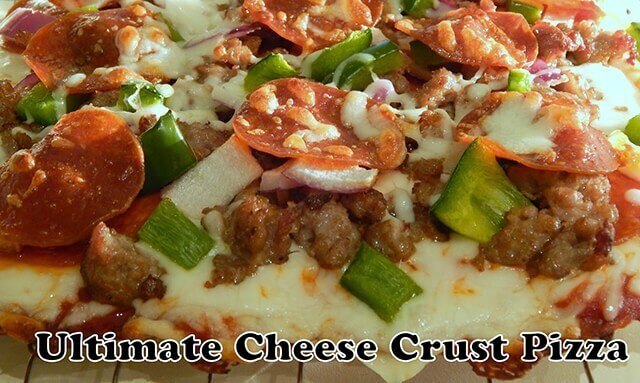 Top the pizza crust as you desire and place back into the oven for approximately 10 minutes or until the cheese is bubbly and melted. Remove from the oven and allow to cool for a few minutes before slicing. Enjoy! Entire crust has just 8g net carbs. 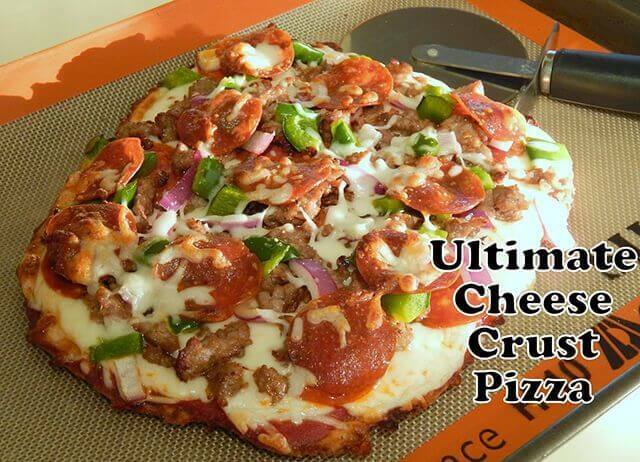 Crust should feed 2-4 people depending on their appetites. CutTheWheat.com - Check out our latest recipes! Need Ingredients for That Recipe? It takes a lot of trial and error to find the "right" fit for a low carb recipe. I have made some ... different low carb desserts. You don't need to go through that! I made a list of my favorite ingredients as well as what stores you can find them at. Enjoy! Eating healthy, for me, is about more than weight loss like it used to be. 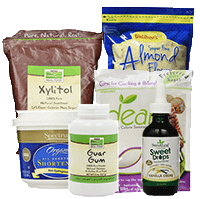 It’s about controlling my blood sugar levels and obtaining normal–or relatively normal–hormone levels. I still struggle to lose weight efficiently, but eating a wheat, sugar and gluten free diet helps to control some of the problems I’ve encountered with these health issues of mine. cutthewheat.com is a participant in the Amazon Services LLC Associates Program, an affiliate advertising program designed to provide a means for sites to earn advertising fees by advertising and linking to Amazon.com. Additionally, cutthewheat.com participates in various other affiliate programs, and we sometimes get a commission through purchases made through our links.